I recently received a review copy of Chris Thomasma’s The Adventures of Clarity Girl #1 and before I went into reading it, I did a bit of digging around on Thomasma’s work as well as the character of Clarity Girl. Though this is a first issue, this is not the first time a story of Clarity Girl has been published. In 2016, Chris Thomasma teamed up with writer Bill McCormick to release Clarity Girl: Smick City Savior. 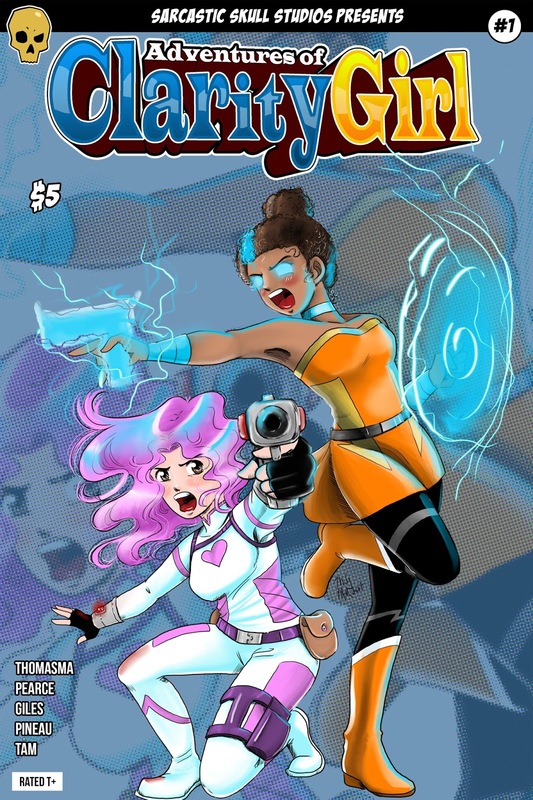 It seems that Thomasma decided that the character of Clarity Girl needed a new series, in which her backstory was a bit more developed and allowed readers to understand more of who she is and where her powers came from. Thus, The Adventures of Clarity Girl was born. When writing about a superhero, I do think it’s very important to flesh out a proper backstory so readers feel like they truly understand the character and what he or she is fighting for. I think Thomasma made a smart call in showcasing just where his heroine came from. That being said I feel like issue one perhaps was a little overambitious when it came to hashing out the story. There are a lot of things happening in this issue, but I feel like many of them don’t necessarily get explained as well as they should be. Reading this for the first time, I felt the need to do a little bit of digging to understand some things about it, which in my opinion should not necessarily be the case for a first issue. Because I have not read the previously released comic, I am uncertain how Clarity Girl was portrayed, and this issue does mention the death of her mother, but I found her character to be a bit unlikeable and have a bit of a spoiled, mean girl type attitude. When more is revealed about her high school past, it is eluded to that she may have spent most of her life with a less than heroic personality. Though it is my assumption that we see a flawed, even bratty at times, main character in this issue because eventually Thomasma plans to show some serious character growth in coming issues, I do feel like issue one should give you a character you like and want to learn more about, but I found her characterization a bit flat in this issue. I definitely would have liked to see some more redeeming qualities in the main character, personally, but again, I feel like issue one focused more on telling a backstory as quickly as possible in order to get to the real meat of the series. Further proving Thomasma’s ambitiousness, he also did all of the character art in this book, save for the cover. His artistic styling is lighthearted and youthful, making the scenes feel almost like a still television cartoon. Though the art itself is not overly detailed, I think it works with the playful storyline and dialogue you find within the issue. The cover, drawn by Tam Thuy, will certainly get this book noticed at a booth. It is vibrant in its anime style quality and definitely catches the eye. All in all, I enjoy the idea behind Clarity Girl. It’s an all ages title that explores serious issues such as bullying, suicide and life as a young adult. That said, I do think it is important for the writer not to get too caught up in exploring every detail about the series all in one issue. I think for issue two, Chris Thomasma really has to focus on letting things developing more naturally with characters, story and plot. There is no need to rush things or pack too much in one single issue, as it tends to feel frenzied and confusing and many times plots with a slower burn tend to hold one’s attention a lot more. It is my hope that issue two is a bit less busy and really puts the clarity back in Clarity Girl.